Tree roots are poison in any sewer system but fortunately if you act quick you can maintain them for years if it’s not to late. Make sure you clean you line before this happens to you. Read below. There are several sewer lines in the world we can help and prevent excavation but sooner or later something will go wrong. No one wants to spend money to repair their broken collapsed sewer line but you have no choice at that time. I wish we could predict when it will happen but we can’t. Customers much appropriate when our drain technicians open their sewer system cause then they know that digging is not needed “yet”. Excavating a section of pipe isn’t cheap by any means so try and plan and keep current on the condition of your sewer line yearly. Call us today for annual main sewer line cleaning and see where your sewer lie falls on a scale 1-10. 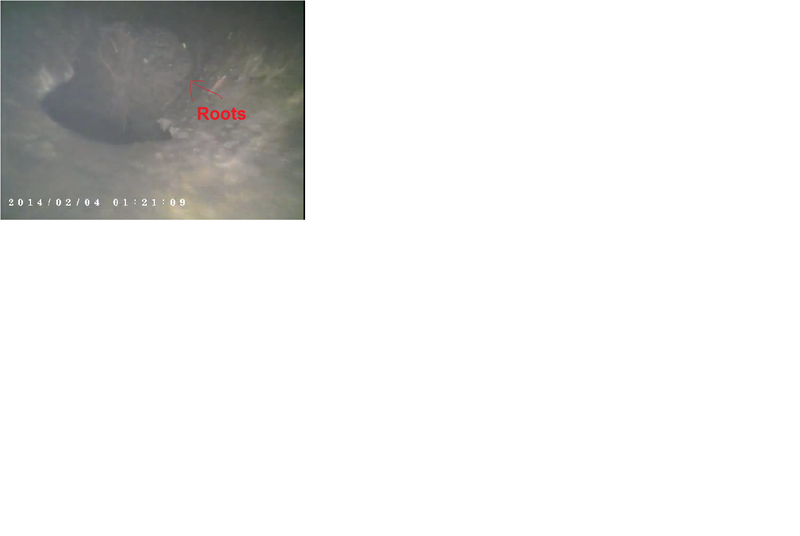 The picture above shows the red arrow pointing at the a clump of thick tree roots that broken through the sewer pipe. When I drain technician suggests camera inspecting your sewer line there’s a reason for it. If your smart next time you have your sewer line cleaned get it video taped and see what condition your line is in. If you are lucky enough o have a good sewer line we suggest getting it televised every 3-4 years after to make sure it’s in tact. Think of it as an x-ray that dentist use to view the condition of your mouth. Also, if your uncertain that the technician or company is leading you in the wrong direction ask your family and friends who’ve they have used in the past. make sure they were confident in there work and give them a call. You don’t always have to make decisions quick. Take time and do your due diligence.